If you haven't heard of the special programming and events at the Alamo Drafthouse's, then you are missing out. Not only do you get to see some of your favorite films on the big screen, you can join in for some interactive activities that will enhance your appreciation to the film. Dallas Movie Screenings had a chance to enjoy The Princess Bride with inflatable swords, bells, and bubbles. 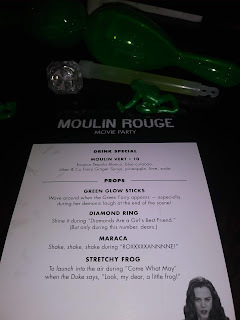 Moulin Rouge included light sticks, rubber frogs, flashing diamonds, and maracas. Audience participation is a blast! Before each film they offered games and contests to win movie passes like sword fights or doing the can-can. Enjoy this musical classic with interactive props and loads of audience participation. Experience Moulin Rouge! like never before, at all 5 Alamo Drafthouse DFW locations through Valentine’s Day! Grab your gal pals for these special screenings on Feb. 13! Our chef is whipping up a special 3-course Valentine’s Day dinner for one of the best romantic comedies of all time. A celebration of love, passion, and life, Moonstruck starring Cher and Nicholas Cage is a must see for this week's holiday. Movie screenings, gift cards, Mondo gift ideas, and more! ​The entire collection of Oscar nominated shorts screening at the Denton location! Catch up before the actual ceremony on February 24.